My spontaneous Paris trip was off to a great start. On Wednesday I woke up before the sun had even bothered to rise and headed drowsily to the Trocadero for an epic Eiffel Tower photoshoot. Afterwards, frozen to the bone, I hurried back to my hotel to jump back under the covers and extra blankets I'd requested from room service in an attempt to thaw out. After a bit of a nap, I met up again with a friend at the Army Museum and after exploring a bit of the museum and passing Napoleon's tomb, we began walking through St. Germain. 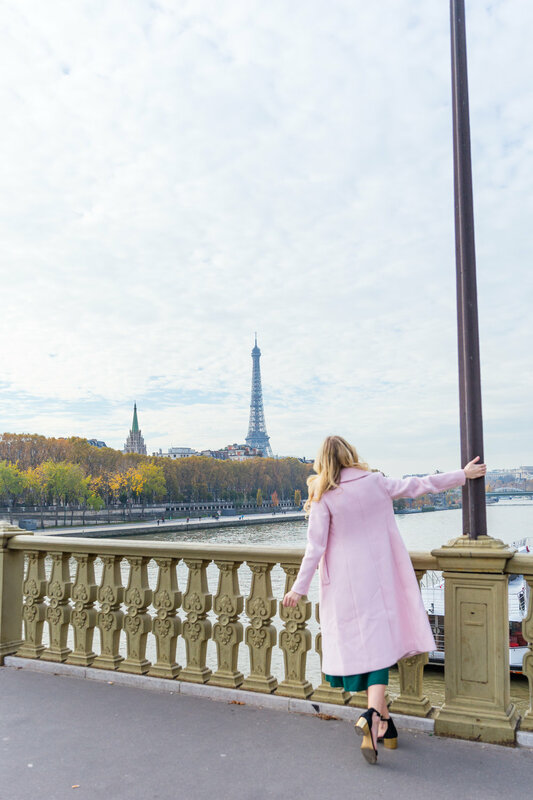 We stopped at a few little boutiques and chocolate stores, passed the infamous Cafe de Flore, and eventually wound up at Odette overlooking Notre Dame. We got some pastries and coffees and sat for awhile after having essentially walked half the city. Next we walked over to the Pantheon, circled back to explore the Latin Quarter, and wound up at the Luxembourg Gardens. At this point it was getting dark so we took a bus back to my hotel and grabbed a late dinner at the nearby Jaja, a great little crowded restaurant. The next morning I was finally able to sleep in a little bit and I woke up slowly before ordering room service. I enjoyed my huge breakfast on the balcony and took my sweet time getting ready and wasting the morning away. Around noon, I met up with my new friend Michelle and a fellow blogger, Jenna, who happened to be in Paris as well. Jenna was babysitting her adorable niece Madison and the three of us meandered towards the Champs-Elysées, stroller in tow. Michelle had to leave to catch a train so we said our goodbyes and Jenna and I continued on. We soon stopped at a cafe for Madison to be fed and for a glass of wine for ourselves, of course. Eventually we wound up at the Arc de Triomphe and stopped for some photos. My other friend met me at the Arc and I bid goodbye to Jenna. I was off to explore Montmartre and the subway was not a friend of a stroller, as adorable as baby Madison may be. We took a long metro ride to the edge of Paris, then the funicular up to the Sacre Coeur cathedral. There is a great view overlooking the entirety of the city, though that evening was hazy and gloomy. After taking a look inside the cathedral we walked the streets of Montmartre past cute cafes and shops, winding up at the Instagram infamous La Maison Rose cafe for a few photos. As the sun went down we got back onto the train and wound up back in the Latin Quarter, not far from where we'd been the day before. We wound up eating burritos at a Mexican place for dinner, so not very French, but a good change of pace in a way. The week was going by way too quickly and there was so much more to see and do... A week is just not enough time, but I'm glad I got to see most of the main sites during my stay. Thanks Jenna and Justin for the photos!